Whether you are craving a trip to the mountains, a few days on a lake, or a romantic weekend on a quiet country estate, there are many amazing options in New York. 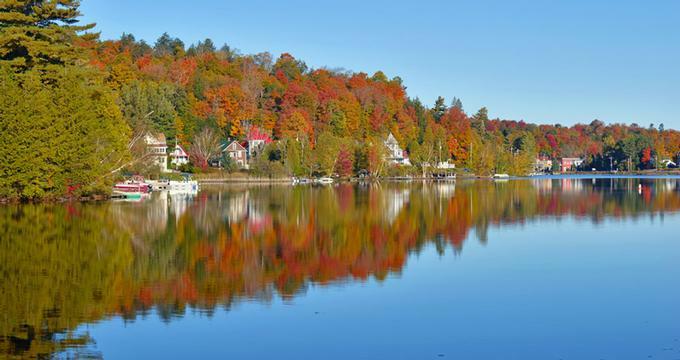 Head to the Adirondacks if you love fresh mountain air, visit the Hudson Valley to hike through beautiful forests, explore the Finger Lakes wine country, or check into a stylish inn in the Hamptons, NY to relax in the sun. 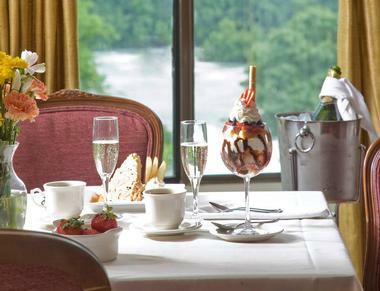 The Red Coach Inn is a historic hotel overlooking the gorgeous Upper Rapids of Niagara Falls. This Inn dates back to 1923 and has the atmosphere of an English country house with a Tudor exterior. Guests have a choice between guest rooms, one-bedroom suites, or two-bedroom suites, and each of the accommodations has unique decorations with gorgeous restored pieces and antiques. A majority of the suites have canopy beds, kitchens, and fireplaces and every room has air conditioning, a whirlpool tub, terrycloth robes, and toiletries from England. Glenmere Mansion, a member of Relais & Chateaux, is situated on a 150-acre estate with Glenmere Lake views, giving guests the opportunity to explore the land with romantic strolls or relax at the full-service spa. The retreat was built in 1911 for industrialist Robert Goelet and is about one hour by car from New York City. The mansion features elegant furnishings, a sweeping marble staircase and a private art collection. There are 18 guest accommodations, including premium suites, junior suites, superior bedrooms, and deluxe bedrooms. Every room is slightly different, and they are arranged with fine antiques, private art, sumptuous beds, and unique furnishings. All rooms have heated floors in the marble baths, custom Italian linens, high-speed Internet, iPod docking stations, and other modern amenities. Guests can spend a relaxing afternoon at The Spa at Glenmere Mansion and dine at one of the restaurants on site. The atmosphere of the Supper Room is romantic and intimate. Frogs End has a full bar and light and informal meals; the Cortile is ideal for dinner parties, lunch, or dinner. Guests have to be 18 or older to stay at the hotel. Rooms start at $750 per night. The Maidstone showcases its Scandinavian heritage creating an eclectic space for couples to discover and enjoy. There are a total of three cottages and 16 rooms, each of which was individually designed with inspiration from a Scandinavian celebrity. The rooms feature handcrafted Hastens pillows and beds, all-natural toiletries, aromatherapy burners and essential oils, an electric kettle, a French press, and a minibar. Guests can sip complimentary organic coffee, complimentary Maidstone Darjeeling tea, or purchase wine and champagne from the Wolffer Estate and take advantage of a shared DVD library. The hotel is designed to make you feel welcomed and has a “Scandinavian Cozy” theme that includes Scandinavian trinkets and influences as well as traditional designs with comfortable chairs and couches. Guests also get to enjoy complimentary yoga, beach parking, Kronan bikes, a concierge, a spa, a library, and there is even a place for well-behaved pets. Every morning, guests are welcome to have breakfast from the continental Scandinavian buffet with the option of adding items from the menu. Rooms start at $435 per night. 1000 Islands Harbor Hotel is one of Upstate New York's few AAA Four-Diamond luxury resorts, located in the charming city of Clayton along the banks of the picturesque St. Lawrence River. The hotel, which provides convenient walking access to area attractions such as the Clayton Opera House, the Antique Boat Museum, and Boldt and Singer Castles, features spacious guest rooms and suites with pristine wood floors, flat screen televisions, and private balconies with river views. Upgraded rooms offer whirlpool tubs, wet bars, and living room space. Guests can choose from a variety of onsite dining options, including the upscale Seaway Grille, the casual Riverside Patio, and the relaxing 1000 Islands Bar. 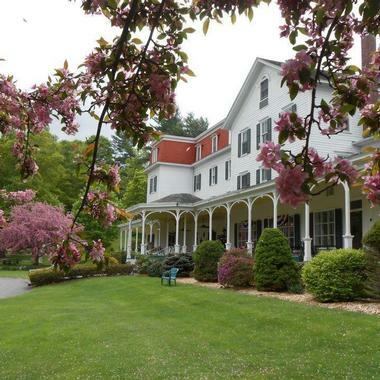 With fireplaces throughout the Victorian home and stone pillars to complete the picture of refinement, Mount Merino Manor in Hudson provides couples with a charming vacation experience where they can make the most of a weekend of romance. Visitors have their choice of seven spacious suites and guest rooms to select from with features such as spa-jetted showers, whirlpool tubs, candle-lit fireplaces and beautiful views. Each room has individualized decor featuring period pieces, fine fabrics, and other beautiful furniture pieces. There is Wi-Fi throughout the manor and guests are welcome to use the plush robes, Egyptian cotton towels, soothing bath salts, and aromatherapy bath products. The bed and breakfast’s property includes 100 acres of woodlands, offering shade as well as secluded spots. 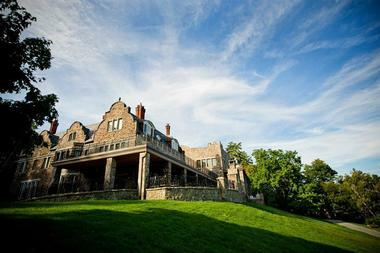 The manor and surrounding woodlands provides guests with stunning views of the Hudson River and Catskill Mountains. 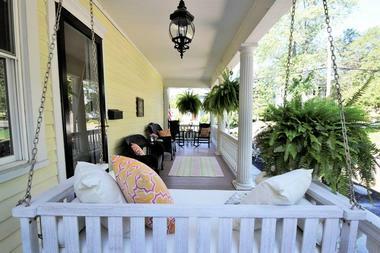 You can watch the sunset from the wrap-around porch or play a game, read a book, or watch a movie in the cozy parlor. Every morning, guests are served a full country-style gourmet breakfast in the well-lit dining room. Breakfast includes home baked breads or muffins, seasonal fresh fruit, a hot entrée, local bacon, and fresh eggs. Rates start at $295 per night. More weekend & day trips: 50 Best Things to Do in the Hudson Valley, New York. 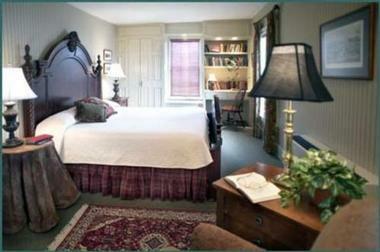 This luxury boutique bed and breakfast is surrounded by wooded hills in Canandaigua within the Finger Lakes region. There are three bedroom suites to select from, each with a fireplace, king-sized bed, soaking tub, and full walk-in shower, making them perfect for a romantic weekend. Each room is also equipped with microwaves, refrigerators, coffee and tea makers, Wi-Fi and climate control. Some rooms have sitting areas, balconies, kitchenettes, gas stoves, and space for an extra guest on a pullout queen sofa. The inn’s private location gives visitors the opportunity to enjoy romantic walks along the trails, strolls by the ponds, or take excursions to wineries and other nearby attractions. There is a romantic balloon ride that leaves from the chalet so you don’t have to worry about transportation. There are also numerous nearby trails, places to golf, and skiing in the winter. Rates start at $245 per night. 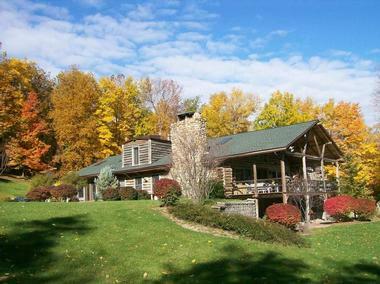 10 Fitch is a whimsical, elegant, and relaxing Finger Lakes getaway designed for adults only. There are three guest suites to select from, each of which is uniquely and decorated. All rooms come with a Butler’s Basket with basic toiletries, en-suite bathrooms, walk-in European rain showers, Turkish bath towels, handmade olive oil soap, luxury bedding, spa robes, and nightly turndown service. The Copperfield Inn Resort is one of the top places to stay in the Adirondacks. There are a total of 31 guest rooms and suites to select from, including standard queen and king rooms, executive king rooms, demi suites, fireplace suites, and townhouse suites. All rooms are oversized and have luxurious bathrooms, flat screen TVs, a DVD player, satellite entertainment, an electronic safe, a ski rack, and a radio alarm clock. Some suites also have Swedish showers, Jacuzzi tubs, private balconies and/or fireplaces, plush terry cloth robes, and refrigerators. The resort has free wireless Internet, a tennis court, a heated swimming pool, a hot tub, an indoor sauna, and spa services in the health and fitness center. Guests can relax by the fire in the sitting room or take advantage of the seasonal shuttle to Gore Mountain. You can enjoy live entertainment while eating hearty pub fare at Trappers Tavern or a Mediterranean-inspired meal at Lorenzo’s Restaurant. Rooms start at $179 per night. The Inn at Windmill Lane is a place for couples to get away from it all and relax, appreciating ocean views, and having a chance to read or simply enjoy nature. Guests have the choice of staying in a cottage, suite or house. There are three cottages, each with its own distinct size, layout, and features, such as wood burning fireplaces, dining nooks, living rooms, cathedral ceilings, patios, personal steam rooms, and exercise rooms. Each of the seven suites is memorable and comfortable, complete with a king-size bed with Matouk linens, original artwork, hardwood floors, oversized marble bathrooms, rain showers, wood burning fireplaces, and access to the common exercise room. You can also choose to stay in the four-bedroom private home with four king bedrooms. Every guest has access to beach parking, towels, chairs, and umbrellas as well as the common room with a pool table and games, iPads in their room, transportation to local attractions, and 24/7 staff availability. The suites and cottages have high-speed Wi-Fi, bathrobes, a minibar, coffee maker, wood burning fireplaces, and more. All guests can start their day off with a continental breakfast. Suites start at $375 per night. The Mansion Inn in Saratoga transports guests back in time with six fireplaces, original gas chandeliers, and an unsigned Tiffany chandelier. There are eight unique rooms for guests to choose room, some of which have Jacuzzi tubs or private decks and most of which have beautiful views of the grounds and surrounding scenery. All the rooms have antique beds which have been retrofitted to hold queen or king beds, and each room has private bathroom facilities, clock radios, free Wi-Fi, exclusive French bath amenities from L’Occitane, fine bedding, and individual air conditioning. The entire building has been decorated and furnished with Victorian antiques and there are two formal parlors where you can enjoy a glass of wine or socialize with other guests. The library features relaxing seating options, books, and a grand piano. If you prefer, you can relax by the pond where you will find swans and a cascading stream. There is a complimentary innkeeper’s reception every evening, and you have the option of adding a range of packages to your stay such as romantic snacks, cakes, or wines. Rooms start at $130 per night. An intimate weekend at The Inn at Erlowest gives couples the chance to stay in a turn-of-the-century Queen Anne stone castle right along historic Lake George in the Adirondack Mountains. 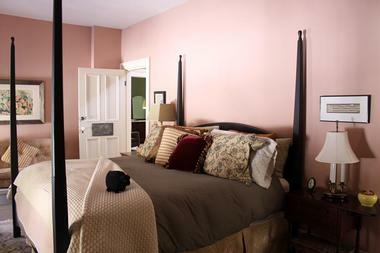 There are a total of ten guest rooms, each of which has been restored and furnished with turn-of-the-century antiques. 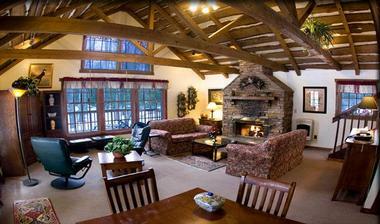 Each room is slightly different; some have views of the lake, gas fireplaces, and whirlpool tubs for two. Most rooms have spacious private baths, king beds with canopies, Jacuzzi bathtubs, gas fireplaces, hardwood floors, Wi-Fi, and flat-screen TVs. Upon arrival, guests are greeted with complimentary champagne as a welcome to The Inn at Erlowest. The Sherwood Inn began as a stagecoach stop in 1807. Today, the building is fully restored with pegged wood floors, four fireplaces, fine wood detailing, and antique furniture. It can be found along the scenic Skaneateles Lake. There are 25 guest rooms, each of which is meticulously and individually decorated to create a charming and cozy environment. Some of the rooms include amenities such as fireplaces, Jacuzzi tubs, oak armoires, canopy beds, lakeside views, and/or sleeper sofas, and there are even adjoining rooms if necessary. The menu at the Sherwood Inn is seasonal, and serves different specialties throughout the year, such as the Baked Scrod Christopher and Yankee Pot Roast. Guests are welcome to a complimentary continental breakfast in the dining room or Lakeview Porch. You can also enjoy lunch, dinner, or a Seafood Raw Bar on Fridays in the Tavern. The Main Dining Room has a romantic wood-burning fireplace. The Inn at Lake Joseph in the Catskills is a beautiful lakeside retreat with 16 romantic rooms and cottages. This upstate New York getaway is pet-friendly which means that you can bring your pooch along on your relaxing trip surrounded by mountains and lakes. Rooms are located either in the lodge, cottage, or carriage house, and each displays a unique decor. Amenities vary slightly from room to room, but include options such as wide-screen HDTV with premium channels, Sirius satellite radio, wireless Internet, a fireplace, whirlpool tub, private sundecks, and two-person whirlpool baths,. Some rooms have their own coffeemaker, refrigerator, and microwave and all have access to the guest kitchen. You will find snacks and lunch set up 24 hours a day, and there is always a hot breakfast in the morning. A 2,000-acre forest sits just next to the inn, providing opportunities for hiking along numerous trails. You can also go snowshoeing, cross-country skiing, fishing, kayaking, play tennis, go boating, or swim in the pool or lake. Other amenities include a billiard room, games room, library, outdoor fire pit, and the ability to rent equipment such as bikes, kayaks, volleyballs, and more. Rooms start at $235 per night. The Batcheller Mansion Inn is located in the center of Saratoga Springs along Congress Park and gives guests the chance appreciate an elegant mixture of living history and atmosphere in a Victorian home. Throughout the building you will find period pieces, hand-carved marble fireplaces and original furnishings. Guests can select from one of nine rooms to stay in - there are standard, superior, and deluxe rooms available. Each room is slightly different and all are named after famous individuals who have visited the Batcheller Mansion. Every guest gets to enjoy a full breakfast cooked to order in the morning. You can also relax in the foyer, the parlor with 12-foot French windows, the dining room, a library with heirloom chairs, or the numerous porches. During your visit, you can take advantage of spa services from the comfort of your room or, if you’re feeling more adventurous, go on a mansion tour to learn more about its history. Rooms start at $169 per night. Lake Clear Lodge and Retreat is designed as a relaxing escape that lets you enjoy indoor amenities when you’re not exploring the nearby Adirondacks. Each of the rooms has a unique story and is eco-conscious. Couples can book one of the two B&B-style chalets, 3 rooms, 3 private chalets, or 5 suites with lake views. Accommodation options also include private chalets, two lake view suites, or a one-bedroom lake view suite. The private artisan chalets have fireplaces, and some have saunas, Jacuzzis, and lakeside views. The lake view artisan suites have dens, and several include Jacuzzis and fireplaces. The B&B rooms in the 1886 main lodge each have a private bath. You can also rent the full Lake House or Guest House. The Lodge hosts discovery workshops throughout the year, and you can also go scuba diving, canoeing, biking, hiking, kayaking, golfing, horseback riding, or explore the area with a guided adventure. If you prefer winter activities, there is ice fishing, snowshoeing, cross-country skiing, snowboarding, downhill skiing, skijoring, tobogganing, and snowmobiling. The on-site restaurant serves all meals and has seasonal Adirondack dishes. You can also have a drink in the Wine and Beer Cellar. Rates start at $199 per night. More Upstate New York getaways: The Ultimate Niagara Falls List: 15 Best Things to See & Do and 25 Best Romantic Places to Stay Near Niagara Falls. Winter Clove Inn is an all-inclusive getaway nestled between the Hudson Valley and the Northern Catskill Wilderness Preserve, making it the ideal spot to appreciate the surrounding nature. There are 50 rooms in the three-story wooden building, which dates back to the 19th century. The Main Inn has a large living room and is the center of activity while the Oaks Lodge has a familiar, homey atmosphere and a common room on each floor with a mini-fridge and TV/DVD player. 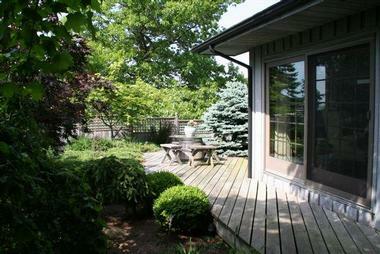 The Carriage House is a three-bedroom suite featuring two baths and is perfect for families. The inn also has an expansive front lawn, large porch, and gorgeous landscaping. There are rocking chairs to lounge in while taking in views of the Hudson River, as well as an outdoor pool, heated indoor pool, waterfall, tennis court, basketball court, playground, antique bowling alley, 9-hole golf course, shuffleboard court, hiking trails, and cross-country skiing. Every stay includes three meals per day, so you never have to worry about finding somewhere to eat. If you are looking for affordable weekend getaways in Upstate NY, all-inclusive rates start at $95 per person per night. 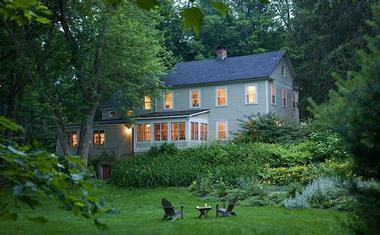 The Inn at Green River is a historic Federal-style farmhouse built in 1830. There are seven guest rooms perfect for romance and many of them feature whirlpool tubs, two-person showers, deep-soaking tubs, and fireplaces. Every room has a view of the expansive grounds next to a large meadow. Each room has a slightly different layout and decor with individually selected pieces to create a cozy, romantic atmosphere. Hobbit Hollow sits on top of a hill, presenting guests with beautiful views of the meadows below as well as Skaneateles Lake and the nearby vineyards. This Colonial Revival farmhouse dates back to the turn of the century and has five guest rooms that are comfortable, elegant, and fitted with period furniture. You will find private baths, four-poster beds, and antique accessories, adding the finishing touch to your romantic getaway. Depending on the room you select, you might enjoy a full, queen, or king-size bed, gas fireplace, whirlpool tub, soaking tub, walk-in shower, and/or private verandah. Every guest room has a private bath as well as personal amenities and spa robes to help you relax. Rooms are also equipped with air conditioning, wireless Internet, and private phones. Guests can enjoy views of the farm stables, meadow, or lake and complimentary access to snowshoes. There are light refreshments in the afternoon and a full country breakfast in the morning. Rooms start at $225 per night. The Black Sheep Inn and Spa is a romantic getaway for couples looking to explore the Finger Lakes Wine Country, giving them all the comforts of a historic home. Each of the five guestrooms has a unique style and design with monogrammed robes and plush towels in the private bathrooms. You can select from a room with a full, queen, or king-size bed and all rooms have handmade organic soaps in the bathroom. The spa offers a range of indulging experiences such as massages with handcrafted products. If you find shopping more appealing, there is a Mercantile on site, perfect for buying souvenirs. The nourishing breakfast served every morning comes from local, organic farmers with all of the ingredients traveling no more than 50 miles to reach the Inn. The kitchen can accommodate most dietary restrictions. You can enjoy a lunch or dinner on site or as a picnic. If you find yourself wanting to explore a little, the inn arranges luxury excursions to nearby areas, such as trails, wineries and microbreweries. Rooms start at $159 per night. The picturesque village of Skaneateles on the Skaneateles Lake is a delight for all senses. It is the place that inspired famous painter John Barrow to create some of his most spectacular landscapes. The house in which he lived, built in 1834, is today the home of 34 State Historic Luxury Suites, an opulent, luxurious bed and breakfast that will envelop you in the unexpected comfort and coziness of a real home. Wonderfully decorated with art and antiques, with such special touches as a grand piano and a gas fireplace, the inn combines the luxury of a high-class hotel and the welcoming feel of a luxury home. Snuggled in the heart of the Finger Lakes Wine Country surrounded by 30 acres of spectacularly beautiful hills, valleys, and forest groves and neighboring beautiful Hi Tor State Park, The Vagabond Inn is a romantic refuge for those who would like to explore the surrounding wilderness without having to rough it. The inn’s five suites, each with unique touches and beautiful opulent décor, have fireplaces, TVs, microwaves, fridges, private hot tubs, wet bars, and even private dining areas for romantic private candle-lit dinners. All guests share an outdoor pool with a gazebo and hot tub surrounded by serene Japanese gardens. When you are ready for some action, the Bristol Mountain Ski Resort is just a short drive away.